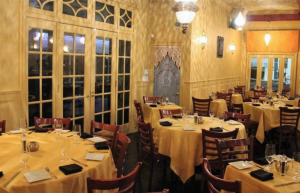 Nordine Achbani (former general manager of Polpo) and his wife Soumia opened Argana in 2017. It’s attractively decorated in black and yellow with a Moroccan theme. The menu is full of exotic dishes, which the attentive staff is happy to explain. Our favorites are B’stilla (sweet & savory pie) served in bright Moroccan pottery and Zaalouk. We are fans of the traditional mint tea. If it’s not on the menu, ask for it.